It’s really important to collect a few important statistics to measure a project’s progress. One of my goals is to create an app that has over 25,000 users, an arbitrary number but one that’s high enough to use as evidence that it appeals to people outside the early-adopter geek crowd. 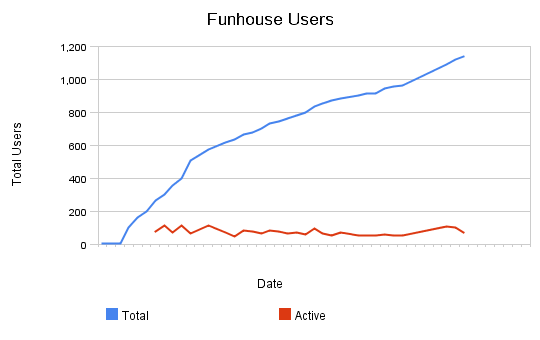 I’ve been collecting daily statistics since I launched Funhouse Photo, and I wanted to do analysis on them. At the top is a static image of the graph I created using Google Spreadsheets, and I’ve included a live link below. I’d never used the Google office products before, and I was pleasantly surprised. They’ve done a good job replicating the usability of a desktop app on the web. Unfortunately my OS X Firefox 2.0.4 wouldn’t display the graphs correctly, and neither would Safari. Luckily, if strangely, FF 2.0.4 on Vista did work, so I was able to complete the job using that. There’s a knee in the total user curve, and that corresponds to my introduction of asynchronous image loading. This is strong evidence that it’s something that puts users off using the app, and so makes improving that seem important. It’s hard to see any other changes in the adoption curve’s slope. This means that all the other upgrades I’ve done to the app haven’t had an impact. Adding more effects, including notifications in user’s feeds and the profile button all failed to increase adoption. Getting a positive review didn’t result in more users. Facebook recently introduced a "More Stats" option for all apps. This gives you access to a lot more information about the number of adds and removes, as well as a sample of the actual urls people are visiting. There’s no way to download the history, so for now I’ll keep manually entering them every day. Funhouse Photo User Count: 1142 total, 74 active. Still the same slow growth trend. Extrapolating, the entire planet should be using the app in around 411,000 years. Event Connector User Count: 11 total. I’m still waiting to hear back on the bug I filed about secret events, and on my resubmission to the directory, but I am talking directly to some event organizers about trying it with their meetings.